Simply put, we use nothing but top quality materials. We install all types of roofing systems including fully adhered rubber (EPDM), modified asphalt membranes and hot asphalt. Harbor Roofing and Vale Roofing have complete in-shop and mobile sheet metal capabilities, for all roofing requirements. We are experts in installing all metal roof systems. EPDM (short for ethylene propylene diene monomer) is a single-layer durable, synthetic rubber designed to resist damage from the sun. Light yet resistant to scuffs and tears, this roofing material enables simple patching when necessary. Thermoplastic roofing such as TPO and PVC is made of a durable yet lightweight material that is ideal for both new construction and retrofits. 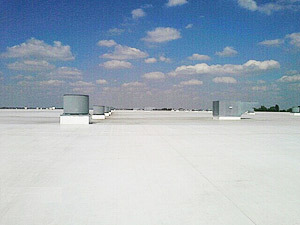 TPO’s white surface reduces air-conditioning costs, and is very resistant to temperature extremes as well as ultraviolet, ozone and chemical exposure, high winds, punctures and fires. Modified Bitumen is a durable reinforced asphalt usually installed with at least two layers of roofing. The roofing and hot asphalt create a waterproofing layer. Gaining popularity. New finishes such as Kynar allow for a 45-year colorfast warranty. Commercial buildings benefit from long lasting, fire-resistant, low-maintenance roofing with sheet metal. Remember that in many commercial buildings, a sheet metal crafted roofing system can be durable and long lasting with very little maintenance. For long-term solutions, metal roofs are leading the way. As heating and cooling bills continue to rise, metal roofing systems are guaranteed to keep heating and cooling bills at new all time lows. What’s more, sheet metal roofs last longer than any roofing system in the marketplace today.